Emmanuel Acho was another nice find for me at the LNF Bowling tournament. When I asked him to sign my card, his response was- “Gladly!” SaGe made some strides back to reality with their 2012 set, as many fans were put off by the 2011 cards. 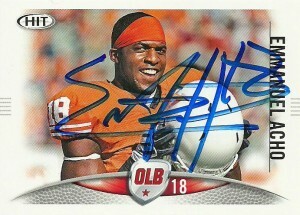 Certainly I was excited to get this one autographed by the former Longhorn. As a linebacker, Emmanuel is the younger brother of Sam Acho. He clocks in at 6’2″, 238 and had an impressive career playing for the Longhorns racking up 278 tackles, 8 sacks, 41 TFL, and 2 picks. He was considered a find in the 6th round of the 2012 draft for the Browns, but he was injured in training camp and spent the complete season on injured reserve. It is expected that with new coaching blood taking over the franchise in 2013 that Acho will step up and contribute in the Browns linebacking corps.